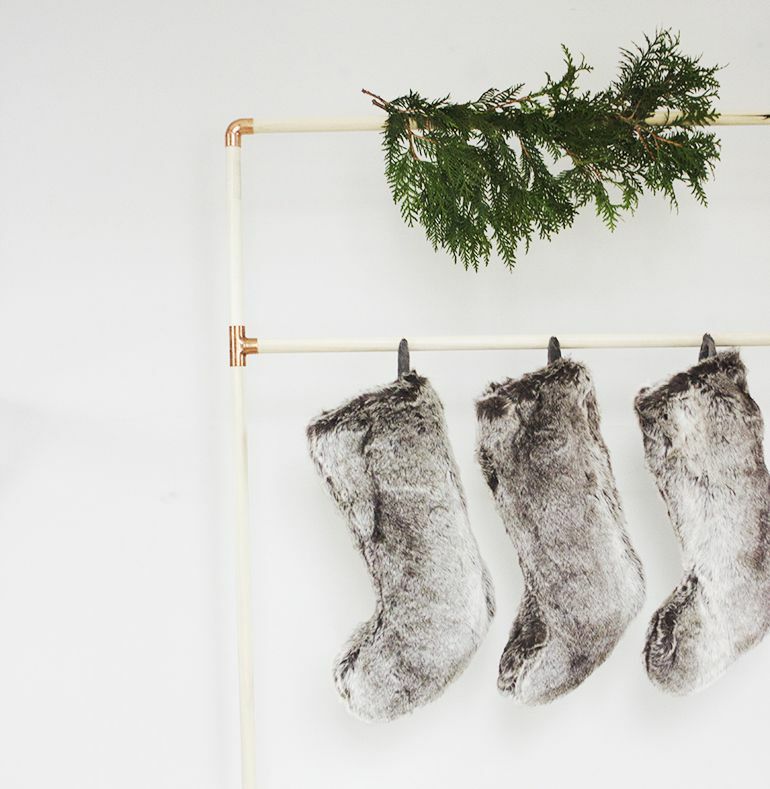 If you lack a fireplace to hang stockings from this Christmas you can make a stylish rack out of copper pipes to hang them from with this beautiful do it yourself copper stocking rack. Instead of the traditional wreath on your front door add a huge joy sign to greet your guests as they arrive with this sign that is made out of moss. This beautiful sign is easy to make using precut wood letters available at the craft store and a large bag of green moss, making it the perfect project for when the weather is cold outdoors and you want to do a holiday themed project indoors. Deck your hall with this fun fa la la banner, one of the lines from the popular Christmas carols Deck the Halls by making your own out of cardstock. The inexpensive project is the perfect way to decorate a wall in your home or can be hung by your fireplace instead. Make a more modern version of the traditional boxwood wreath that is popular over the Christmas season by creating a diamond wreath instead of the standard circle shape. The completed wreath is a wonderful way to decorate your front door for the holidays. Every house needs mistletoe over the Christmas season to add a bit of romance to the holidays. Get your own by making this paper mistletoe ball that you can hang from the ceiling so that any two people walk underneath the mistletoe they will need to kiss. Add a few of these DIY giant stars to make your home feel more festive, by using up some of your extra holiday wrapping paper to create the stars. Perfect for Christmas, if made out of metallic or glitter paper these giant stars could be the perfect photo backdrop for a New Year's Eve party too. Make this sequin wreath that would be perfect in your home for Christmas or New Year's Eve, by wrapping sequin ribbon around a foam wreath to add some sparkle to your holiday decor. This giant snowflake marquee is a wonderful way to light up your living room, to make your own you will need to cut a large board into a snowflake shape and use one of your extra sets of Christmas lights for the lights. Transform your front door into a giant present by wrapping it with a large ribbon for a quick decorating idea. Inspired by the beauty of the forest in winter this stunning winter wreath that looks like snow covered branches with the word Joy spelled out of paper mache letters covered in decorative tape hanging in the center of the wreath. If you are looking to truly transform your home interior into a winter wonderland make a bold impact by building a huge joy sign out of wood and chalkboard paint that will leave your home feeling like a rustic lodge.